Nothing is easier to wear than a nice white top, right? 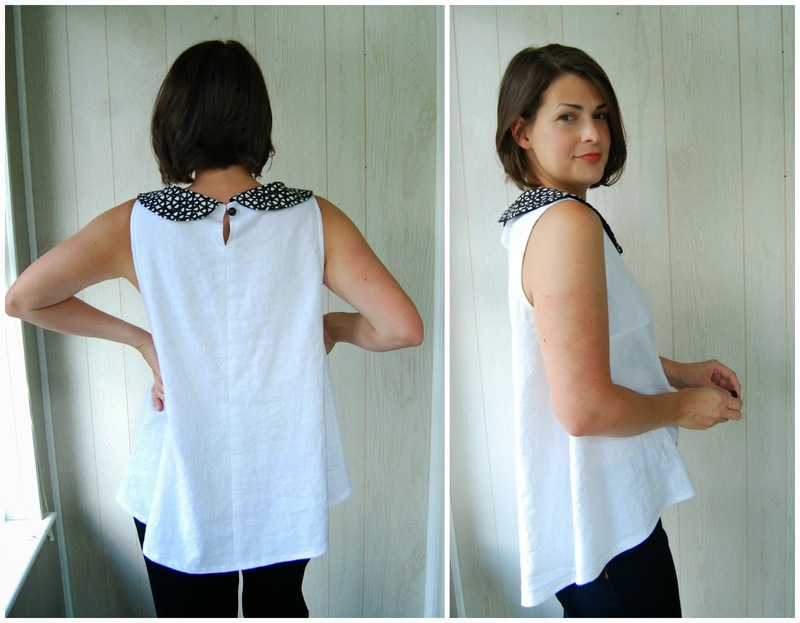 I made two versions of Simplicity 1693 in white linen and a white cotton lace. Actually, I've made several versions of this pattern now, but these two are the first that will definitely be worn. My first version was that blue floral number that was hanging on the wall in my photo of all my recent duds. There is technically nothing wrong with that top, other than a slight snugness across the upper bust. But I am very meh about the fabric. I used a rayon I thrifted that obviously came straight from the early 90's. And I just don't love it. I was trying to work from my stash. But it does make a good muslin! Let's just pretend that was what I intended it for. I'll keep it around in the closet, but I doubt it will get much wear. 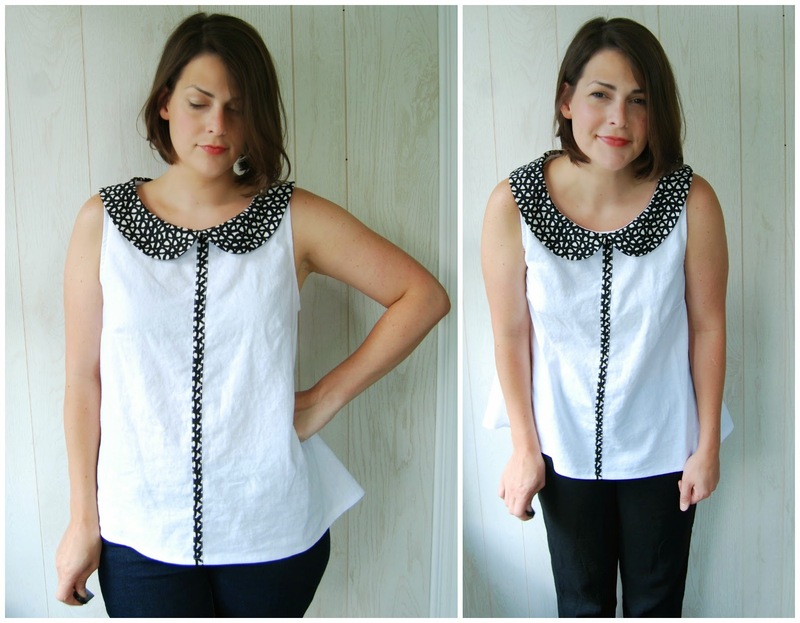 I decided to try another version of Simplicity 1693 since I have been digging the swingy blouse here lately. I figured it was a really good contender for work appropriate wear which I mentioned that I am in dire need of in my last post. Thank you all, by the way, for all of your awesome suggestions. When I read through that post again, I realized how frantic I sound. And I am, really. But not about what I'm going to wear to work. 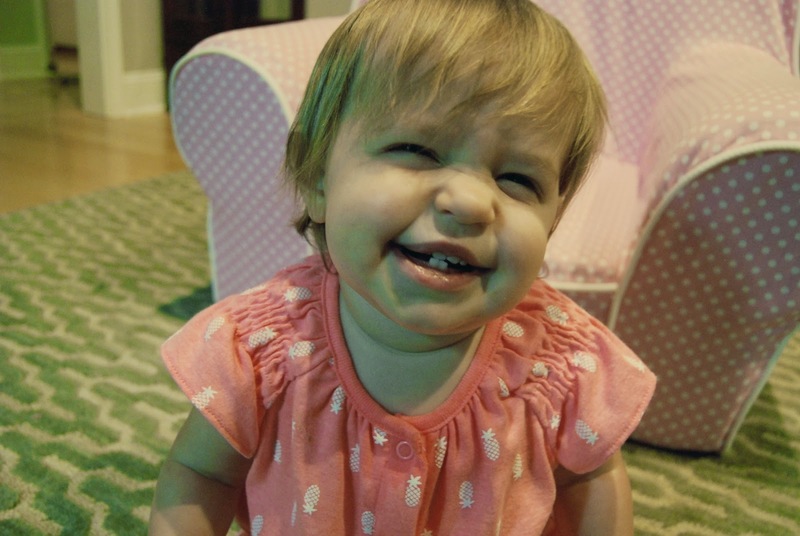 I am anxious about actually having to go back to work after spending my summer with baby Jane. Ugh, I can't even talk about it. It makes my stomach hurt to think about it. I have really enjoyed being home with her. And don't get me wrong, I feel very fortunate to have this time with her. And I feel fortunate to have the fulfilling job that I have. But, you know, it's your baby. I wish I knew what the right answer was. So... misplaced anxiety. However. Work clothes. I made two more versions using the swingier view. I made a few tweaks after my muslin. I cut a size smaller initially than I normally wear after reading the finished measurements. My muslin fit great in the shoulders but I did feel a slight pull through the upper bust. 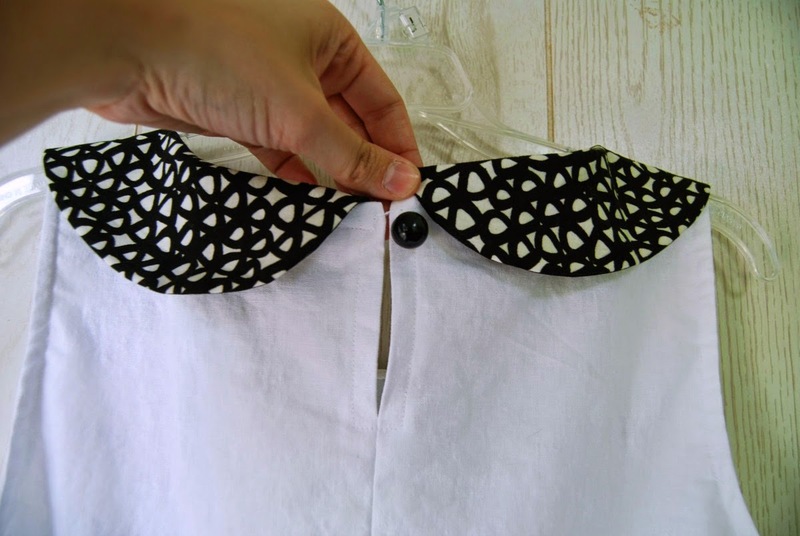 This pattern doesn't require any fitting at all except through the upper bust and shoulders. So I did a small broad back alteration and also lengthened the pattern by one inch. I even traced my new pattern on to swedish tracing paper because I was feeling fancy. And I'm glad I did. Because I've made several versions (with alterations) now and I have a couple more in the pipeline. 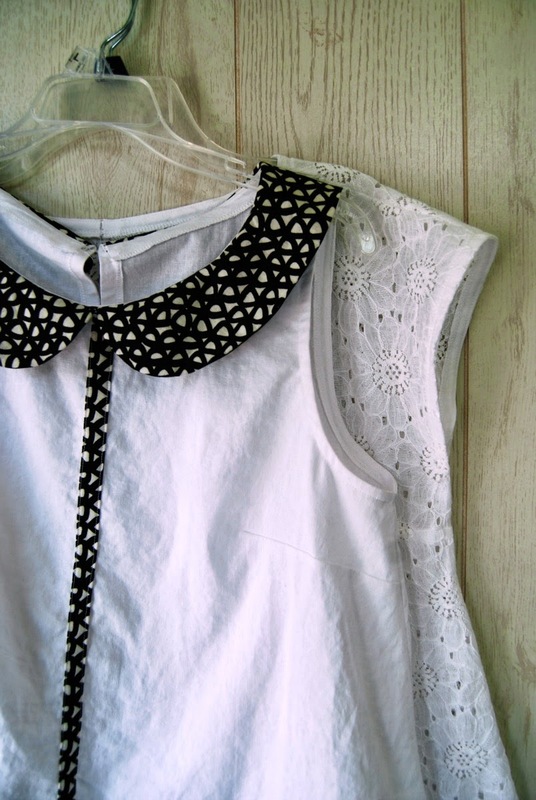 I made the version with the peter pan collar first. I can't say I'm in love with the collar. In fact, it was one of those things I swore I'd never make. It's a little too cute, if you know what I mean. The main fabric is linen an the collar and trim is quilting cotton. I had one small scrap of this black and white print from when I did some appliqué for a friend's baby shower. It felt good to use it. The underside of the collar is a slippery black synthetic to keep it from being to stiff. The big, swingy shape is not the most flattering. But man, do I love wearing tops like this. 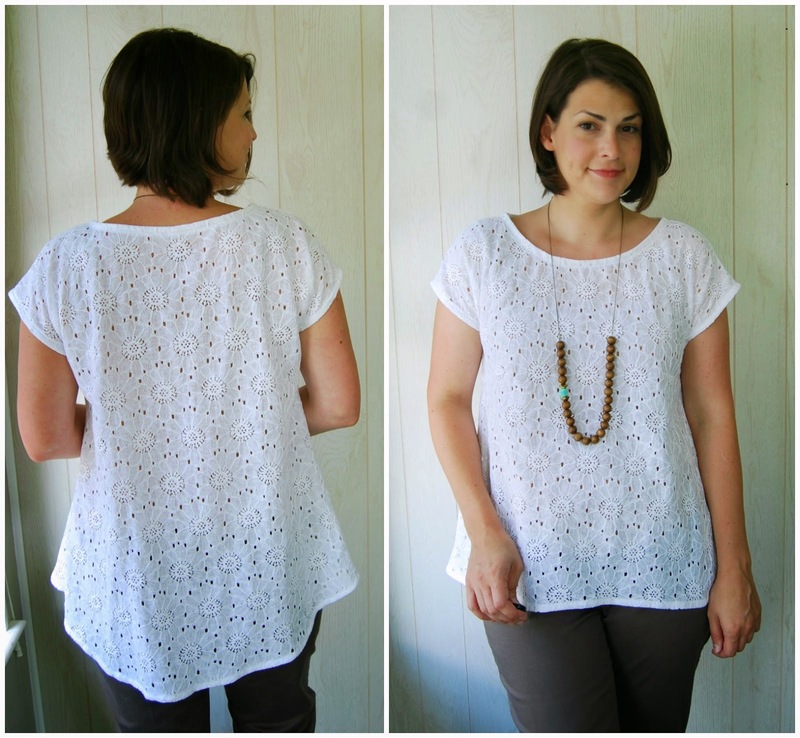 They are so easy to throw on in the morning even if they are a little reminiscent of maternity tops. I finally splurged for a camera remote. I haven't mastered hiding it or making sure I'm in focus yet. Who I am kidding, I probably won't ever try to hide it! It sure does make taking pictures quicker. And can we just take a moment to appreciate this button at the back opening? It's a vintage button from my stash and it's just perfect. A friend gave me a jar of vintage buttons from a family member who obviously cut them off of all her old clothing. I have a bunch, but these perfectly round ones are my favorite. I have two more. The back opening here is non-functional, though, since I can slip the top on over my head. Just for looks. The neckline and armholes are finished with bias which I flipped to the inside (is that considered a facing?). I made this cotton lace version next. 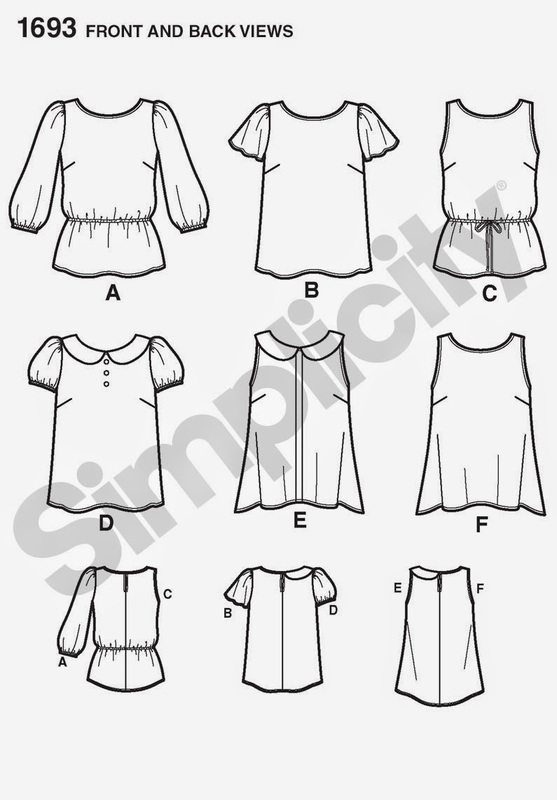 I used my favorite drafting book, Winifred Aldrich's Metric Pattern Cutting for Women's Wear, to help me visualize how to add a cut on cap sleeve. I love that drafting book. It seriously is the best. It has every thing you could ever want to draft. Even though it's metric, sometimes you just need to see a picture. I love the cap sleeve. I traced a new pattern when I made this one so I could use it again. I also eliminated the center back seam and opening. It's a very simple shape and one I know I will use again. Not the most exciting top but it will definitely see lots of wear. The lace was easy to sew since it is cotton. I finished the sleeve and neck openings with a strip of the white linen from the first top. So yay for pull on tops with no fasteners. These were both quick and easy makes. Both made during one nap each! That's my kind of sew. I've gotten some really good sewing time since my last post. I've got a few other things to show yet. And I'm still on my sewing bender for two more weeks so I'm hoping to crank a few more pieces out. Trying to take advantage of that misplaced anxiety- ha! She's fifteen months old now and walking everywhere. Finally. It took her a while to walk but as soon as she took that first step, she was off. She won't let me hold her anymore. She wants to do it all herself. She is just the best. Happy weekend! Of the last twelve things I've made, only three of them are real life wearable (my beach bum shorts and skirt and my white Luella tunic in case you were wondering). Three! Three of twelve. Twenty five percent. Those are not good odds. My friends, I am officially in a sewing rut. A deep sewing rut. I have made the occasional wadder in the past, of course. But never this many in a row. I'm discouraged. I've sat looking at the duds (no pun intended- ha!) for a while now trying to figure out why. Why so many? Why have I lost my sew-jo? What is it that makes each piece a failure? In the past, I figured there are two main reasons a piece doesn't work. The style of something is just wrong. Either the fabric doesn't work with the pattern or the shape just doesn't work for me or my lifestyle. Or there is some technical issue that makes me not want to wear it. Like a floppy collar, pointy darts, a pucker or something weird about the fit. In the case of every single dud I've finished recently, it's the style that I don't like. I'm making things that I don't like! What's wrong with me? I spend hours making something, then put it on and think... meh. I feel like I used to have such a good handle on what I liked and didn't like. Now I don't know. To be fair, some of those pieces above are okay. The crazy kimono is growing on me. The green skirt is a refashion of this dress. I wasn't going to wear it again and I didn't want to waste that pretty dip dyed linen. And I am planning on fixing my Nicola dress bodice at some point. I don't have the confidence to do that now. Someone asked me a while ago if I thought my style had changed since becoming a mom. I hadn't really thought about before then, but now I can answer with a definite yes. The problem is that I don't know what it has changed in to. I am delving in to this now because I desperately need clothes I can wear to work. I teach art in an elementary school, so I can get away with work wear that most people can't. I don't need corporate work apparel or anything. But I do need to look put together. I need nice work clothes that make me look like I know what I'm doing (i.e. things with real waistbands, buttons, collars, etc.). When I went back to work last school year, I bought a bunch of stuff in a hurry because nothing fit. 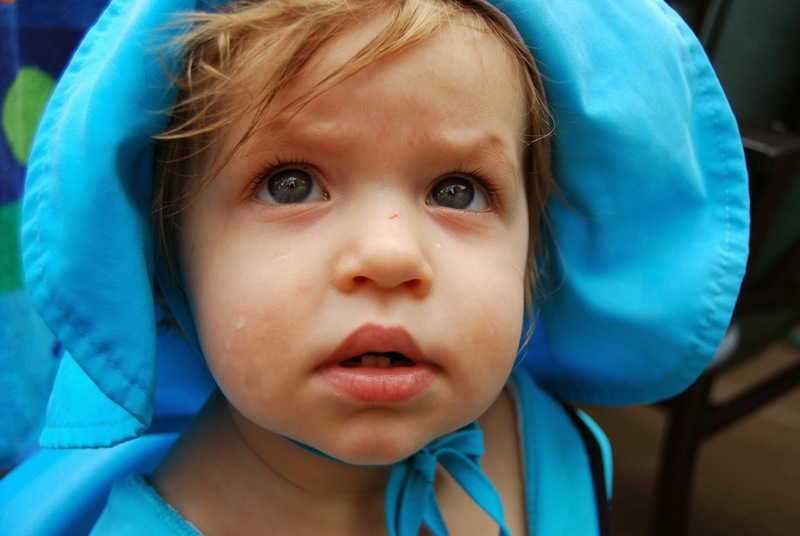 I was four months postpartum. I bought several skirts and a pair of black pants with an elastic waist from j.jill. I do love that pair of pants, but it's hard to wear them without looking like you have your pajamas on. I didn't care at that point. I was just trying to figure out how I was going to eat lunch and pump at the same time. Then by winter, I fit back in to my old clothes. Yet I didn't find many things I wanted to wear. I wore weird things last year. I think I wore the same pair of corduroys about seventy-five percent of the time with different blouse-y tops. Moms of little ones, help me out. What do you wear on a daily basis? ... here is something I made that ended up perfect.